lu Deniz is an area of outstanding natural Beauty it lays at the foot of our highest mountain in this region called Babadag. Olu Deniz is where you will find the beautiful Blue Lagoon with its astounding turquoise waters, this is one of the most well known photographed areas in the world, and the local Government in Turkey has put a preservation order on the Blue Lagoon and it is to remain unspoilt. At the other end of the Lagoon along the main beach front you will see many good quality hotels, bars, restaurants. There is also a nightclub and a comedy lounge. A bowling alley is also open until late evening. The restaurants and bars are very relaxed with a large number of them overlooking the beach front. 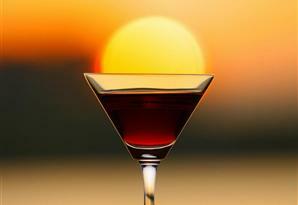 The busiest time is during the early evening when you can watch the beautiful sun set while you sip a cocktail. For the day time activities in Oludeniz, there are daily boat trips leaving around 9.30am that offer a free pickup service from your hotel. This is a full day out and includes your food. Drinks are extra. 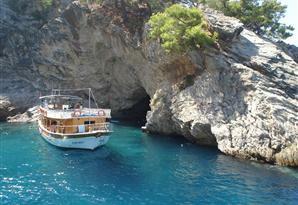 The boats will take you to the coves and other beautiful islands situated in the local bays, also the beautiful famous Butterfly Valley which is just along the coastline from Oludeniz. You can snorkel in the Blue Lagoon where there is an abundance of Star fish and other colourful fish. Scuba Diving, Para sailing, wind surfing, and Jet skiing or you can hire Quad bikes by the day and explore the area. Car hire is also available. 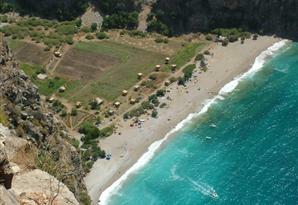 For the more daring, there are paragliding trips from the top of the famous Babadag mountain. You will be taken up to the top of the mountain by road, the ride up to the top of Babadag takes around 50 minutes. The views at the top will take your breath away. The take off point at the top is 1,700 meters high above sea level, the brave will not be disappointed. If you are not so brave you will be able to relax on the beach or one of the one beach front roof top bars and watch the paragliders landing on the beach front. Along the coast road from Olu Deniz are the beautiful villages of Faralya and Kabak these villages are about 20 mins by road. The villages are set up high on a plateau on the other side of Babadag Mountain. These places are truely amazing with spectacular views across the sea, on clear days the Island of Rhodes can be seen. You can reach these areas by local bus (dolmus) and they are away from the main tourist track so you will be able to see more of the local life in Turkey. At the top of Faralya there are a few Turkish eating places, these you will find above the plateaus on the cliff side where you can eat and marvel at the spectacular sea view.